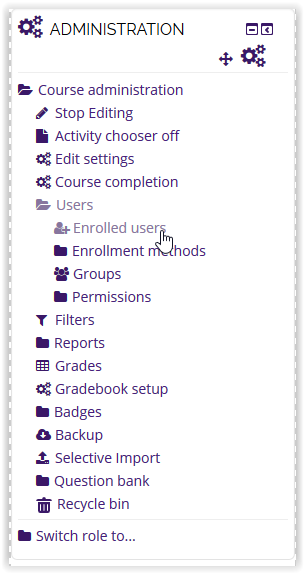 For instructions on how to enroll users into your moodle course, please see GROK article #18367. 2. Under the Administration block on the left side of the screen, click Users | Enrolled Users. 3. Click the X icon in the bottom right corner of the specific student's information box. This is the Unenroll button. 4. A confirmation window will appear to unenroll the student from the course. Click Continue to finish unenrolling.